​Corneal gas permeable contact lenses are oxygen permeable lenses used to correct a variety of vision problems. They are custom fit to your eyes. Gas permeable contact lenses do not flex or fold when handled, which allows them to provide stable vision throughout your day. Gas-permeable contact lenses can be used to correct normal vision problems such as nearsightedness, farsightedness, astigmatism, and presbyopia. They can also be used to correct more complex corneal diseases and irregularities such as keratoconus and pellucid marginal degeneration. ​The main advantage of gas-permeable contact lenses is better vision compared to soft contact lenses. They also have a great safety profile, and corneal infections are much less likely in patients wearing gas-permeable lenses. Their custom nature allows Dr. Rebarchik to design lenses for virtually any prescription. ​Gas permeable contact lenses are not for everyone, however. People who spend a lot of time in windy or dusty environments may find their smaller size leads to foreign particles becoming trapped under the lens. Also, patients with significant corneal irregularities may require scleral lenses. Dr. Rebarchik is residency trained in specialty contact lens fitting. He fits all forms of gas permeable contact lenses, from smaller corneal lenses to mid-sized intralimbal gas permeable lenses. He also fits all forms of multifocal gas permeable contact lenses to help you see your best at all distances. Before your specialty contact lens fitting, a comprehensive eye examination is necessary to verify your prescription and ensure your eyes are healthy enough to wear contact lenses. 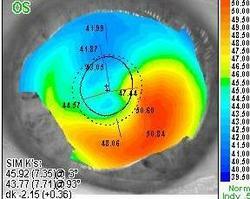 A corneal topography will also be performed to aid Dr. Rebarchik in properly customizing your lenses.